This simple and classy pearl bracelet is comfortable enough to be worn everyday or can be treasured for special occasions. 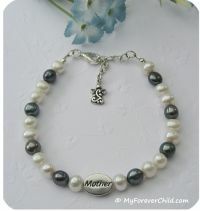 6mm genuine freshwater pearls in cream and blue/grey colors alternate around the bracelet band. 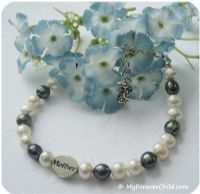 A sterling silver "Mother" message bead is the central focal bead. A sterling silver extension chain allows the bracelet to be adjusted from 7 inches to 8.25 inches. A sterling silver filigree angel charm is the finishing touch to represent the family's angel(s) either on earth or in heaven.